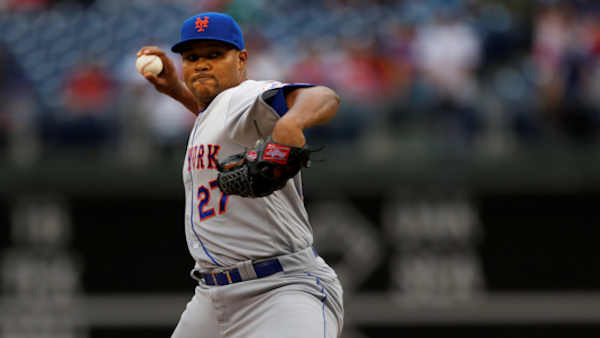 FORT LEE, New Jersey -- A New Jersey judge agreed Thursday to drop the simple-assault charge against New York Mets closer Jeurys Familia, ending the legal proceeding stemming from a domestic-violence allegation. Municipal court judge John DeSheplo accepted Fort Lee prosecutor Arthur Balsamo's recommendation that the misdemeanor charge be dismissed. The judge also ordered the record of the case to be expunged. "I'm happy the case is resolved," said Familia's defense attorney, Paul Brickfield. Balsamo had met with Familia's wife, Bianca Rivas, before Thursday's hearing in Fort Lee Municipal Court. Rivas, represented by her own attorney, did not wish for the domestic-violence case to be pursued. The couple arrived at court together, and Rivas met with the prosecutor for five minutes before the court session began. "She's been steadfast that the matter be dismissed," Balsamo told the judge. Familia had been arrested Oct. 31 after allegedly causing a scratch to the chest and a bruise to the right cheek of his wife. The complaint filed at the time stated that Fort Lee officer Tony Pickens "found probable cause to believe that domestic violence had occurred." However, Rivas subsequently told authorities that the scratch was caused by their 1-year-old son, and the facial mark was caused by pressing on her own head. Two knives the police found on the floor were not intimidating to her, Rivas added. Rivas told authorities her husband wedged them in a door while barricading himself in a bathroom following an argument. "She's clear that was used by Mr. Mojica to wedge the door closed," Balsamo told the judge, using Familia's maternal surname. The end of the legal case against Familia does not preclude Major League Baseball from suspending the closer. Baseball officials had been waiting for a disposition of the criminal case before considering in earnest whether a suspension is warranted. The fact that the case has been expunged from the record figures to help Familia's side. "That'll weigh with the MLB lawyers," said attorney Jay Reisinger, who represents Familia against MLB. MLB recently has imposed serious penalties for domestic-violence incidents, even absent criminal convictions. Jose Reyes received a 52-game suspension to begin 2016 after an incident last offseason in Hawaii involving his wife. The charges against Reyes were dropped after his wife declined to cooperate with prosecutors. As Reyes neared his eligibility to return, the Rockies released him and he subsequently signed with the Mets. Aroldis Chapman, who re-signed with the Yankees this winter after winning a championship with the Cubs, received a 30-game suspension in March despite never facing criminal charges. A first-time All-Star in 2016, Familia led the majors with 51 saves. That set a franchise record and became the single-season record for a Dominican-born reliever. Familia recorded 52 straight regular-season saves from Aug. 1, 2015 through July 26 of this past season.